Jack Lark: Recruit is the second of the three novellas that preface Paul Fraser Collard's Jack Lark series. I don't think it necessary to read the books in order as the stories don't build on one another, but chronologically speaking, the events of the narrative take place between Rogue and Redcoat. 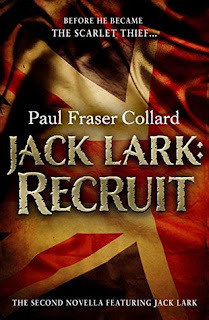 Recruit picks up during Jack’s enlistment and while I thoroughly enjoyed being reunited with Collard’s tenacious protagonist, I was struck by the historic details the author worked into this chapter of Jack's life. Our hero has lofty ambitions, but the reality of achieving those goals isn’t as straightforward as he imagined and I liked watching Jack process and adapt to his new position and circumstances. Charlie Evans shares the spotlight throughout much of the narrative and in many ways his journey parallels Jack’s, but his experience ultimately follows a very different trajectory. In looking back on the story, I can’t say I liked what happened, but I genuinely appreciate Collard for utilizing Charlie to illustrate some of the bleaker truths of soldering for Queen Victoria. Thematically, I think it safe to say Recruit is darker than Rogue, but I greatly enjoyed the contrast in the material and admire the range Collard exhibited approaching this piece as he did. I’m not sure what to expect from Redcoat at this point, but I can’t wait to see what will happen to Jack in the next installment. "It is up to you to live up to the standards set by your forebears, the men who won the victories of which we are all so rightly proud. Men like you may come and go, but the regiment lives on. You must play your part in our history, for the regiment shall endure when you are so much dust."